Google has launched a pilot program that will let owners of Google+ Pages manage their accounts via third-party apps such as HootSuite, Involver and Buddy Media. The program will grant six companies early access to the Google+ API for the specific purpose of letting business owners manage their Pages. Google’s six launch partners include Hootsuite, Buddy Media, Context Optional, Hearsay Social, Involver and Vitrue. 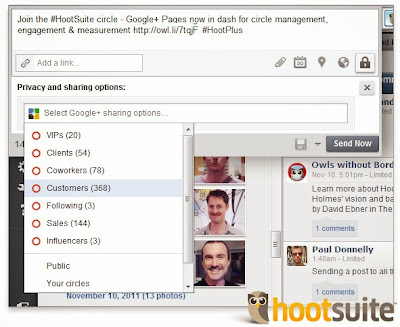 “These companies will offer a subset of their clients the ability to manage Circles, publish to Google+, and monitor usage,” Google+ Pages Product Manager Sara McKinley said in a blog post.